Would it not be great to have something cold in your mouth during those hot days? Think of something sweet, creamy, green and nutritious and you get Avocado Ice Candy Recipe. Ice Candies are such a treat whether you’re a kid or a kid at heart. The best part of this icy treat is that you can make them on your own in a small amount of time. Avocados are usually in season during the months of July to September. You can readily find them in the market for a very reasonable price. There are a lot of varieties of Avocado. Some have very fine texture, others are coarser. Others are creamier while others are a bit bland. So if you have a certain preference for your Avocados, be sure to ask the friendly vendors on which sort of Avocado to buy. This Avocado fruit is among the best super food that you could ever get your hands on. Did you know that it’s the only fruit with FATS? But don’t go shying away from this fruit because this fruit has the FATS that you need to ward of heart diseases. Half a cup of Avocado contains 11 grams of Fat. These 11 grams of fats are good fats that keep your cholesterol levels at a very healthy level. Apart from those life saving fats that Avocado has, it’s also very rich in essential nutrients like Vitamins B5, B6, C, E, K, Folate, and Potassium. Eating avocados also increases your intake of the plant vitamins that you get from your diet. These vitamins are Fat soluble and being a fatty food helps carry those vitamins into your system more efficiently, which is why it’s also good for the eyes as it helps our body absorb all the Vitamin A we get from the food that we eat. See, all that and more when you eat Avocados! Don’t you want to get all these and more? What else are you waiting for then? 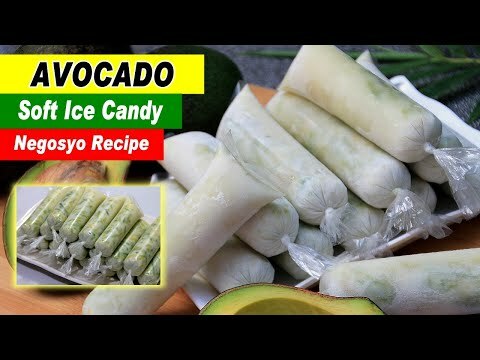 Make your first batch of Avocado Ice Candies and get yourself boosted with Avocado’s super benefits. In a saucepan, combine water and cornstarch, then mix well until fully dissolved. Heat the mixture on medium heat until it starts to boil and turn to low and simmer for about 3-5 minutes just until it thickens like syrup. Remove the pit from the avocado. In a large mixing bowl, put the powdered milk and sugar. Pour boiled cornstarch into the large mixing bowl with powdered milk and sugar. Stir until sugar is fully dissolved. Pour the fresh milk and condensed milk into the mixture and stir until the milk is dissolved. Scraped the avocado meat and add into the mixture. Add the vanilla extract (optional) and stir. Using a funnel and a ladle, pour the mixture into each ice candy wrapper about 3-4 inches high. If you don’t have a funnel you can use a pitcher. Fill, twist and knot the top tightly to avoid leakage. Place the wrap Ice Candy into the freezer and freeze it overnight. Avocado Ice Candy Recipe is very rich in essential nutrients like Vitamins B5, B6, C, E, K, Folate, and Potassium.